Two of the main contributing factors to what makes the Woodpellets.com experience different are – product quality assurance and the convenient delivery system. In order to explain these processes accurately, we let Joy (Quality Assurance Manager) and Dan (Delivery Logistics Manager) describe their main responsibilities – in their own words. Quality Assurance Manager: My primary function is to work for our customers. I am the before, during and after the order point of contact – from Customer Service, to the burn experience at home. Basically, the service doesn’t stop with the delivery – because I’m there to make sure user expectations are met and (hopefully) exceeded. Wood pellet mills across America are running at full capacity, yet some retailers are still struggling with supply levels. Many consumers have felt the strain this year – by being turned away or having to wait for pellets. So if mills are producing the supply as quickly as possible – where are the pellets going? doubled since last year – with more than half the exports going to the United Kingdom. I Keep Getting Clinkers in My Burn Pot. What is Causing This? Clinkers, which look like clumps of ash, can cause airflow issues from blockage. 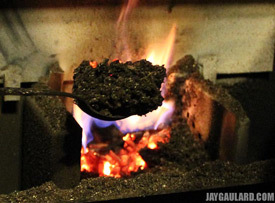 Clinkers are formed by burned or partially burned pellets that melt together into a clump. There are two likely reasons for clinkers – a poor air mixture which due to a neglected or dity unit, or incorrect air adjustments. My Pellet Stove Won’t Ignite. There are a variety of reasons for your pellet stove failing to light. The most common reasons – bad air flow, a dirty unit, bad igniter, blown fuse, bad gasket around igniter – could be easily avoided with regular maintenance and professional inspections. Preference for hardwood over softwood has its origins in the firewood burning community. It has long been considered better to burn hardwood in your wood stove or fireplace because it provides a longer burn compared to softwood. The main reason that hardwood burns better than softwood in wood stoves/fireplaces has to do with wood density (hardwood is more dense than softwood). However, with wood pellets the advantages of hardwood are neutralized by the pelletizing process. Both hard and softwood material is dried to the same moisture level, of about 4-5%. Furthermore, regardless of the type of wood used to produce the pellets, the pelletizing process produces wood pellets with the same density. Once the moisture and density variance has been removed during the manufacturing process, softwood comes out ahead in terms of heat and performance. 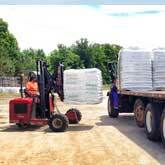 The choice between hardwood and softwood pellets is entirely up to the consumer. There are some very high quality hardwood pellets available in the market that perform very well, but for the most part, softwood pellets will typically provide you with more heat for your money. November is a wonderful time of year. (Surely by now you’ve ordered your wood pellets and/or heating fuel, or it has already been delivered.) The leaves are still changing and falling, the air is crisp, and before the holiday shopping kicks into high gear – Thanksgiving brings everyone together. Since we are feeling so festive, we thought it would be nice to compile some easy new recipes for the big day, leftovers ideas, place-setting guidelines, and a handy cleaning tip. First, let’s start with the bird. With Hearth-oween fast approaching, we wanted to explore some clever ways to decorate pumpkins. Whether you don’t like elaborate carving, or you just want a new look, Country Living Magazine had some great ideas. Choose a dark color, and paint the entire pumpkin! Trace your word lightly where you’d like the thumbtacks to go, and press decorative thumbtacks along your lines. The shorter the word, the easier to see what it says – eek or boo are some great options. Pick up some chalkboard paint at a hardware store, or online. It’s a popular trend to use this kind of paint in DIY projects, so there are a variety of kinds to choose from – spray or standard, colored or black, etc. Then, simply grab some chalk and create your design! Create a careful masterpiece with white chalk for your dinner party, or let the kids go crazy with brightly colored chalk! Carve the top and scoop out the pumpkin insides, like you would do for a traditional jack-o-lantern. Trace the outline of a house on one side of the pumpkin. Then, draw where you want windows to go. Use a brush to paint the house black within your guides, leaving the windows unpainted. Use a carving tool or small knife to carve out the windows. If you’re really skilled, include window panes! This part should be done by adults only. Place candle votives inside and enjoy your new neighborhood! Choose white gourds, or just paint your regular pumpkins. Use Mod-Podge to découpage pressed flowers or leaves along the top. You might want to use faux pumpkins to keep these creations for every year! Instead of Jack-o-Lanterns, make pumpkin lanterns! Carve the top out and remove the inner pumpkin, as you would for a regular carving. Trace outlines of lanterns, leaving openings for where you’ll carve. Paint the lantern design, and carve out the “glass part! Insert a candle votive and light up steps or walkways! Again, leave the carving part for adults only. After removing the top and insides, use hand drills to make holes in varying sizes. If you don’t have hand drills, nails or screwdrivers would work too. Use a knife to make slits in some of the holes for a twinkling star effect! We liked the look of a white pumpkin, but a dark blue painted pumpkin would look great too. A pretty design by day, and a twinkling sky by night with a candle votive! Show us your work! Send us a picture of your creations in front of your pellet stove, wood stove or fireplace for a chance to win a $50 Darden restaurants gift card! Full contest details and rules here. Hurry, the winner is chosen on October 31st! 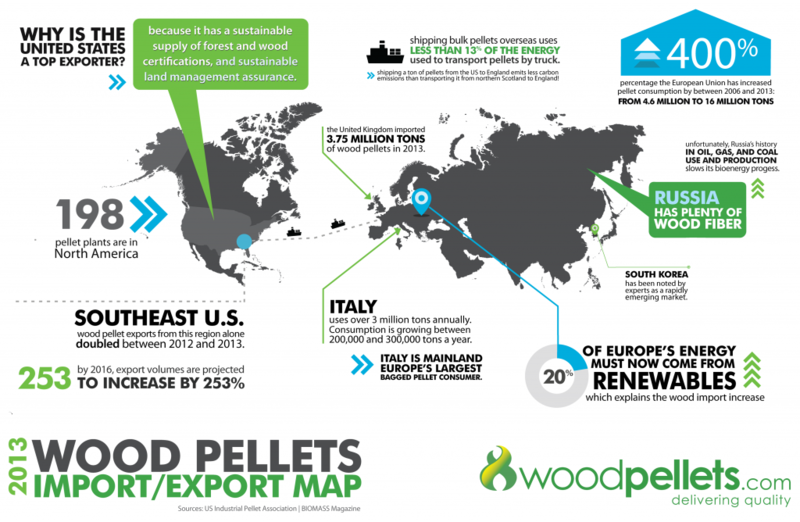 There is only one word to describe the current market in wood pellets – unprecedented. Many of the changes that have happened in the pellet industry have been brewing for years, but the effects have really been felt by consumers since last spring. The appeal of wood pellet fuel has never been stronger, but that has driven some changes that every buyer of pellets will see. Pellet stove sales continue to grow by leaps and bounds. The comfort and warmth generated by a pellet stove, combined with the run-up in heating oil prices and propane last winter, has convinced many households in New England to install a pellet stove. Many of the stove shops we work with in have let us know that their installations of new stoves are up as much as 50% so far this year and sales continue to be strong this fall. Anyone buying a new stove can see a wait time of several weeks for installation as the stores work to keep up with sales. These new stoves mean more people looking for pellets this fall. 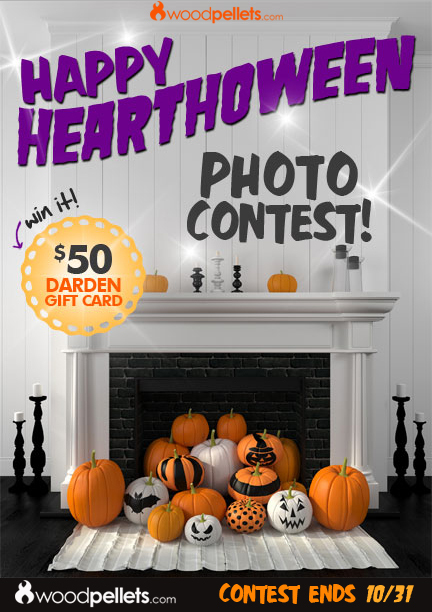 Happy Hearthoween Pumpkin Photo Contest! How do you decorate your pumpkins? Do you carve them into jack-o-lanterns? Do you paint them… or be-dazzle them? Well, now is your time to show us! Simply place your pumpkin creations in front of your pellet stove, fireplace or wood stove, and take a picture to send us! We will pick our favorite on October 31st. The winner will receive a $50 Darden Restaurants gift card, redeemable at any Olive Garden®, LongHorn Steakhouse®, Bahama Breeze®, Seasons 52® or any other Darden restaurant! Full list here. All are encouraged to join in, but the winner must be a current or past Woodpellets.com customer. The winning photograph will be chosen by the Woodpellets.com team on Hearthoween (10/31) at 4pm. It’s the time of year where the phones are steadily ringing, and we are talking with many new and returning customers. Due to other retailers running out of wood pellets and the time of year, our phone call volumes have significantly increased. The Woodpellets.com team is always happy to get you the answers you are looking for, so we have compiled a list of the most frequently asked questions we are hearing during this seasonal rush. 1. Do you have wood pellets to sell me? If you type in your zip code on our website, or tell us on the phone, you will receive a list of available inventory in your area. You might see “Backordered” or “Sold Out” at times. However, if we tell you on the phone or you see online that pellets are available – that means we have them. We would never knowingly sell wood pellets or wood bricks that aren’t available. 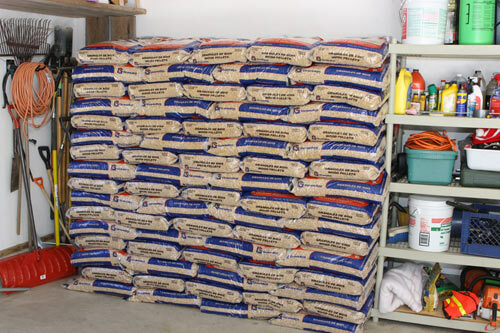 Having recently purchased a new pellet stove, I quickly found myself facing an issue that just about all pellet stove owners face – where the heck do you store all those bags of pellets? a little extra protection. The plastic outer shrouding can definitely withstand a season outdoors. But who wants to trek through snow and ice to get a bag of pellets? I would rather be able to grab them in my socks. Basements are also popular storage areas. But mine is so full of junk… I mean special keepsakes that my wife could never part with…that I literally have no room for three tons of pellets. So I decided to make my garage work.